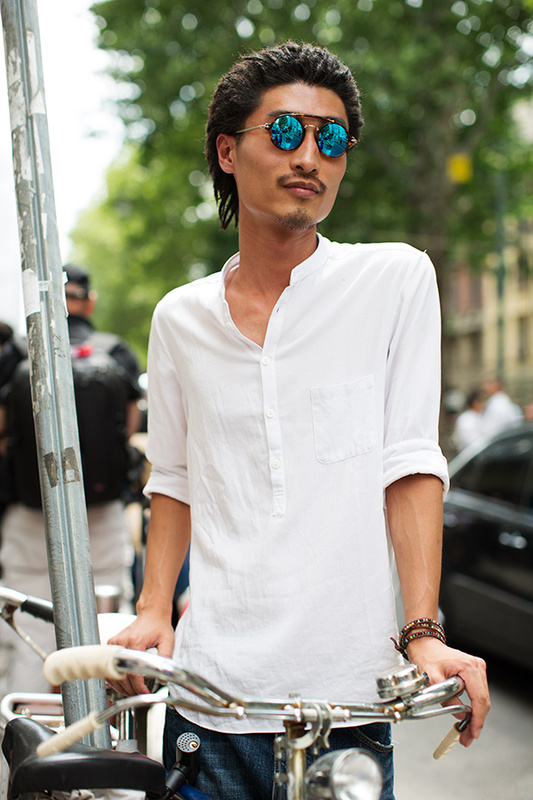 Love the shades and simple white shirt! Lovely shades and simple white tee! So clean! Perfect vibrant but contained pop of color. Love his hair! And that casual white tee is so perfect on guys with tanned skin. Love it! what you do with the pics is so magical. i am mesmerized! Love the simplicity….and catching you in his reflection! I love the style of this guy. He has wonderful glasses. He enjoys your work in Italy, Scott. his blue lens, like dew. Wow! You must have been pretty excited when you got this shot … Those glasses look amazing. I Love the sunglasses, so beautiful! He doesn’t event have to try.,,thats just how cool he is naturally. I heart the sunglasses..absolutely essential if you want to avoid cataracts (although if you live long enough, you get ‘em). But sunglasses, for women, are a great replacement for eye make up any day. I’ll bet anything this guy is Japanese. Tre cool. Wow, cooool sunnies! Gret style, and great photo!! nice picture!! I like his sunglasses!!! Incredible photo. I love how his sunglasses add a pop of colour and kind of vibrancy to his otherwise plain and casual look. Love it! Love how the glasses kind of contrast with his casual style. Oh so dreamy! Love this photo! does anyone know where can I find those sunglasses? Those are the best sunglasses I’ve ever seen in my entire life and this is one of the best pic from MFW!!! love your capture on my town!!! amazing photo!!! so trendy ! Cool bracelet. It goes so well with the white shirt. he’s the coolest. love his shades and his bracelet. The reflector sunglasses are sick! That’s one cool guy. He has complete outward composure. His glasses are really cool, I’ve never seen blue lenses before. I also find his hair interesting, almost like dread locks. Art, love and peace! Beautiful shot! Very sleek and simple, great colour from those sunglasses! This man is a summarize of my summer thought of today. Cool and shiny ! I need that shirt! It’s too hot this summer! I would wear the sunglasses, the shirt and the bracelet in a minute ! I love the hair style and above all, I love his body language : cool, mysterious, suave, refined and that shoulder movement makes me think of a dancer. Very cool. What else can you say, this man’s got it down. Cool and effortless. His skin is flawless – and I love the texture of his hair. Do I see small twists or the beginnings of dreadlocks? can’t tell. Very cool and beautiful photograph!! I love those lenses… I gotta have one of those! Very casual, eyes are bright, but also good. I found this site for some articles written well, about this year’s trend analysis of very good. Not for me that look. So cool it´s already chilly. Beautiful complexion and nice facial hair. Wholesome style. Great glasses! Very nice shot! Scott, I would like to ask, what lense do you typically use for your street shots? great style on a guy, super simple! Want this outfit myself. That’s one cool dude. The sunglasses are wow-not something you see everyday. Is it me or does he look a little bit like Hugo Taylor of MIC? I agree completely with Sevan. shades with round lenses; i don’t know, they ALWAYS look steampunk, which is NOT for everyone; well, who are we to judge?! mmmmm, I feel so clean, crisp and refreshed just looking at this. What a mind-clearing outfit. I study in Milan, but when I’m there I don’t see all the good dress asian that you post, am i blind? Those are some awesome sunglasses. I wish I knew who made them! love, love, love the glasses! very cool and sophisticated. great combination of white shirt and colourfull glasses. Calm, cool, collected. Another fine gentleman. Oh, honey, that’s not your hair. But plus one for the 90s throwback mirrored shades. Asian Dwayne, is that chu??? Sometimes simple is simply the best. I get the feeling that this guy will not sweat even if the temperature goes over 100….such is the power of a white shirt! I can’t stand dread locks on people with straight hair. I like the picture .. it’s very funny and the sunglasses are amazing. Oooooh, I so want his shirt ! It’s absolutely the perfect cut. Now he’s adorable…a cool and easy summer look. Mirrored lenses seal the deal. The mirrored sunglasses, if used right, can skyrocket the outfit. Like this one. 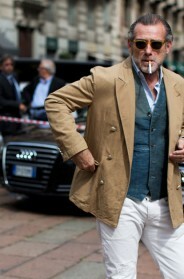 Those are TRUSSARDI sunglasses, a nice wink to 1930s…damn are they nice! I love every detail in this picture. From his glasses, hair to his arteries. Again, a great picture. They might be from the Oliver Peoples Vintage collection. I do know that they have a very similar style. perfect catch. everything was there to be captured and made into a memorable moment. thank you! I am always intrigued by what people are holding in their hands, so many it is a cigarette, for style? What is he holding? I cannot make it out. I love the details Scott, not always the subject but what else is hiding in the photo. Very nice shot. I was flipping through your recent photos & came back to this one several times. The whole thing is perfect. When you’re good, …you’re real good! Anybody know where the shirt is from? I’m pretty sure he’s a well-known Korean actor whose name I can’t remember off the top of my head… . Man I want that sunglasses…..Anybody knows where I can buy them?